demography.matters.blog: "Advances in Development Reverse Fertility Declines" - Science or Hocus Pocus? How should i read the charts? is the year the woman's birth year? "How should i read the charts? is the year the woman's birth year?" Yep. 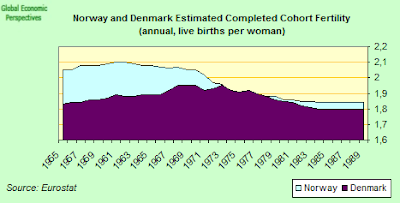 This is the point, this is the estimated completed fertility for women born in that year. Can you see any sign of a rebound? I mean, at present these are just Eurostat estimates, but this is the whole point, noone has any better data, and we won't have it for another 20 years. So everything is conjecture, and my point is what are two experienced demographers, who know perfectly well what the limitations of Tfrs are, doing sending out a piece of research like this and making the claims they do for it? Edward, I honestly appreciate your work in general, but your attempt to debunk the conclusion "that as development continues, the demographic transition goes into reverse" reminds me of those 17th century scientists who declared the Jupiter moons as artefacts of the telescopes. 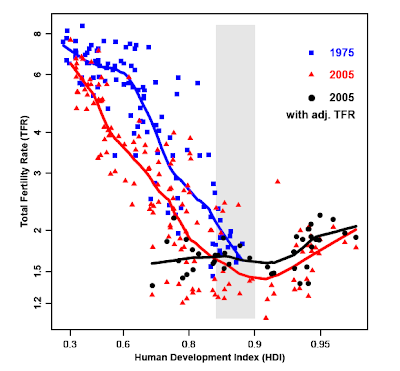 You declare the conclusion of a reversal in the correlation between Human Development Index and fertility essentially an artefact of an inadequate choice for the value of fertility. According to you, the inadequate choice is the normally used PERIOD fertility whereas the adequate choice would be COHORT fertility. In my opinion, a main reason for the dissemination of the concept COHORT fertility is an attempt to obfuscate the debate, and to obscure how wrong the predictions of standard demography actually have been. 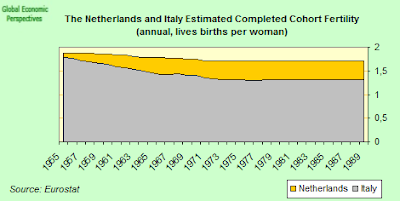 The fertile period of a woman lasts (or is defined to last) 35 years (from 15 to 49). 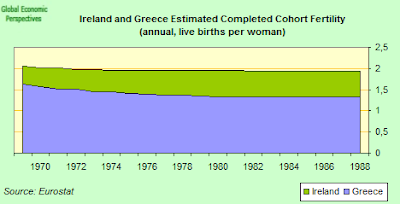 Yet relevant to COHORT fertility is only the number of children at the end of the fertile period. This means that independently from the actual year in which a child is born, the birth is attributed not to that year, but to the whole 35-year period. This is obviously an efficient mechanism to average away changes in fertilty rates. 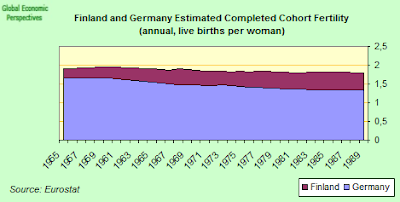 PERIOD fertility as a straightforward concept is a function of time, primarily based on hard data (number of fertile woman, number of births per year). The weak part of PERIOD fertility is the statistical distribution of births within the fertile 35-year period (a woman of 29 years is more likely to give birth than a woman of 49). Yet in any case, if no births occur in a given year, then PERIOD fertility (according to common sense) results in zero for that year, whereas the effect of the lacking births on COHORT fertility is rather insignificant. 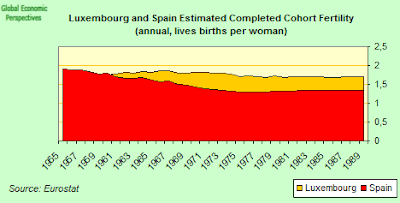 You write: "fortunately Eurostat have published statistical estimates for Completed Cohort Fertility Rates (Cfrs) for EU countries up to the 1989 cohort". That you invoke charts which "should not be treated as hard data, but a rule-of-thumb type quick visual inspection" in order to discredit conclusions drawn from charts based primarily on hard data, remains a mystery to me. The caluculation of cohort fertility for 20-year old women is speculation, because their fertility will end only in 2039. By the way, at least also in Japan, Austria and Switzerland, fertilities have been rather recovering from their lows. 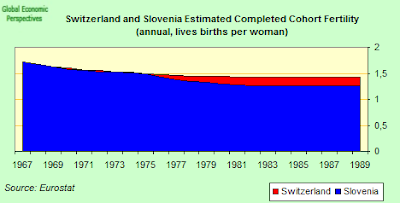 And Russia is a good expample to falsify the hypothesis that postponement is the primary cause of fertility decline. "Why do they include the estimates of 20 year old and not the estimates of 5 year old?" Sorry, you've lost me. The estimate is for how many children women born in a certain year will have had by the time they reach 45. This is how Completed cohort rates are constructed. It has little or nothing to do with what age the women are at at any point in time. "You declare the conclusion of a reversal in the correlation between Human Development Index and fertility essentially an artefact of an inadequate choice for the value of fertility." Exactly. That's it. That IS what I am saying. I am saying they have chosen the most favourable indicator to their case, and done a regression on that, and that this is not the way to do science. If you want to make a strong claim, then you need strong data. "In my opinion, a main reason for the dissemination of the concept COHORT fertility is an attempt to obfuscate the debate"
Well Wolfgang this is an opinion, and you are of course entitled to it. But then you need to address this point to the authors of the paper themselves, since as I point out, they actually agree that the Tfr is an inadequate measure, giving the timing of having children impact, but nonethless choose to use it, and then make a headline grabbing claim, which is all I am really quibbling about. You are right, none of us know where fertility will be 50 years from now, and subsequent generations will find out for themselves. What we do know is that many developed countries have now had 40 or more years with very few children, and this is having a massive impact on relative saving and consumption, and this has produced a huge ecoonomic crisis - the biggest since the 1930s - due to the so called imbalances, and as an economist it is principally this issue I wish to address. "PERIOD fertility as a straightforward concept is a function of time, primarily based on hard data (number of fertile woman, number of births per year)." Yes, of course. But this is about births and not fertility. It is this which gives rise to the so called "missing births" phenomenon, and the serious inversion of the population pyramids, with the long shadow momentum effect whereby a generation with fewer children produces itself even fewer children. That is why some of the declines we are looking at are really quite dramatic. 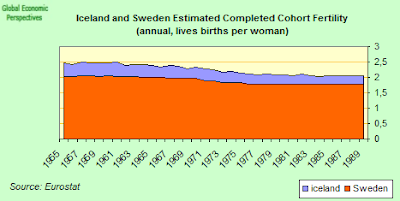 Historical i understand it because in the past 20 year old had children but in todays world the average 20 year old doesn't have children so it is almost completely an estimate. The same estimate is possible on 5 year old so why not on them. 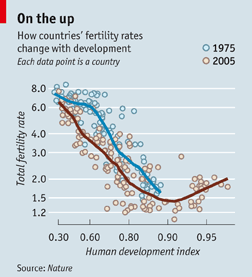 Personally, I find completed fertility rates the most useful statistic. What makes Cohort CFR's even better? And even though, I share Edward Hugh's general criticism, I also suspect that a Demographic Transitionary death spiral -- ever more older people, fewer younger people -- must come to a halt and reverse someday too. Europe is starting to experiment with ideas to bring levels up again, for the simple reason that they must. The right mix of solutions will be found sooner or later. for the simple reason that they must. The right mix of solutions will be found sooner or later. More Money is not working. Lets try to reverse the Human Development Index. Another creative solution could be to put Mennonites in charge of Education and Culture and declare their Church as State religion. If that doesnt work, we all could become Orthodox Jews or Wahhabi Muslims.